Another service check was topping up the rear dampers. The recommended oil for the rear dampers is Shocker Oil No.1 which is an almost clear very thin oil. This is one of those oils which you can;t really find on the high street so I had to order it online. 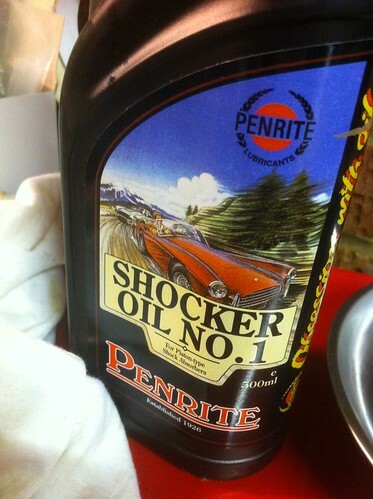 However I've heard of people using motorbike fork oil which I guess would be easier to get locally. The damper fill plugs are located under two plastic grommets, one either side of the rear seat, so you have to remove the seat to access them. The plastic grommets were pretty tough to remove, I ended up using a trim lever with some cloth to protect the paint. Brush off any accumulated crud off the top of the filler plug to make sure nothing falls into the damper, then unscrew the caps - I found a 13mm spanner fitted best, for some reason the size was one of those between all my Imperial sizes. The plugs come off pretty easily, so not much effort required at all. The driver's side seemed to be pretty empty - I could see quite a way down, so I topped it up, though as the oil was really clear it was tough to see where it was filled to - you're not meant to fill past the bottom of the threads. I actually ended up overfilling so had to poke a screwdriver down to pull some oil out. The other side was still full - and this side seemed to have been filled with something like engine oil as it was a lot darker - much more like the Halfords oil I use in the engine and gearbox.